Coaching refers to a training or teaching process wherein individuals obtain support from a professional and certified coach when it comes to attaining the highest level of learning in their chosen fields while also achieving specific professional or personal results and goals along the process. Individuals who decide to get coaching services are referred to as coachee, mentee or client. There are also times when the coached individuals are part of an internship or apprenticeship relationship with their coach. The coaching process also takes place within an informal relationship with one party having greater expertise and experience than the other, allowing him to offer great advises and reliable guidance to the other party. This is where the entire learning process through coaching occurs. Coaching is actually carried out using various methodologies, models and structures and designed in such a way that it suits a mentee’s behavior, personality and requirements. It aims to help various individuals obtain professional advancement or personal growth. There are also specific types of coaching that are effective in helping the mentee in improving his physical skills such as performing sports or art forms. If you want to become a professional in the field of coaching, then you have to remember that the whole process permits learning and development to take place while also improving performance. As a coach, you need to become more familiar about all the styles and techniques that you can use to appropriately coach your mentee or clients. If you are an aspiring expert in the field of coaching, then you should keep in mind that the popular online certification company named Brainmeasures now includes a coaching certification program among its many offers. The coaching course that you will receive from this highly reputable company is guaranteed to help hone your coaching skills so becoming one of the most renowned coaches in the industry at present is never impossible. This certification course makes it a point to explain in detail through its comprehensive coaching training the different coaching styles and techniques that you can use and how you can take advantage of each of them when it comes to improving the performance of your prospective clients. The coaching certification course offered by Brainmeasures is also a major help when it comes to understanding the basic procedures involved in outlining or mapping out a learning plan which is sure to fit the specific needs and requirements of different clients. 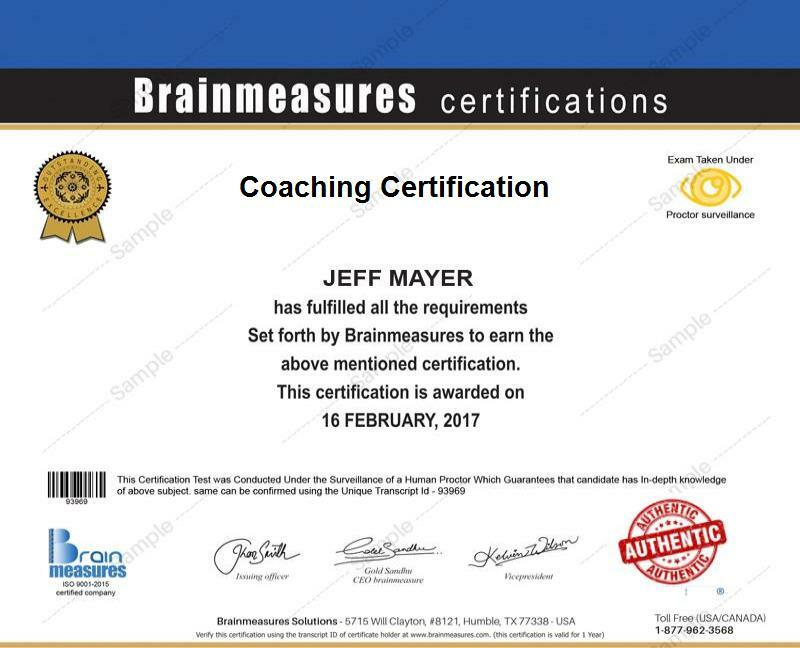 In order for you to finally take a hold of your coaching certificate, you need to successfully accomplish this certification course from Brainmeasures. The coaching certification program which is available at Brainmeasures at present can benefit hundreds of individuals and professionals who are currently working or aspiring to work in this industry. It is more beneficial for trainers, managers, external and internal coaches, consultants and all other professionals who strongly desire to improve their interpersonal communications skills in order for them to better coach their prospective clients. The program is also a huge help in understanding the most advanced techniques that you can use in the field of coaching. Finishing your coaching certification course is a good way to obtain a huge increase in the level of your salary. Being a coaching certification holder allows you to become a career coach which offers an annual salary of around $79,000. You may also enter the health coaching industry which gives you the opportunity to earn at least $60,000 per year. If you venture into the financial coaching industry, then expect this to let you generate as much as $120,000 annually.